Grazia Deledda receives the Nobel Prize for Literature. General Umberto Nobile on the Norge airship, which he designed, doubled the North Pole together with the Norwegian Roald Amundsen. In that year of great events, Davide Cenci also began to write the history of his brand: in the historic Via Campo Marzio, Davide Cenci opens his first shirt boutique, wherein those years Benedetto Croce also bought his shirts. Since the beginning, the boutique has been characterized and recognized as a place where to find collections of brands of excellence and an impeccable customer service. To pay homage to that roaring year, a new line emerged: Dal 1926 - Menswear Crafted in Italy. The best choices of craftsmanship applied to garments, exclusively available in Davide Cenci boutiques. A complete line of coats, dresses, jackets, shirts, knitwear, and accessories. All made with the best fabrics, the best yarns, the best leathers. 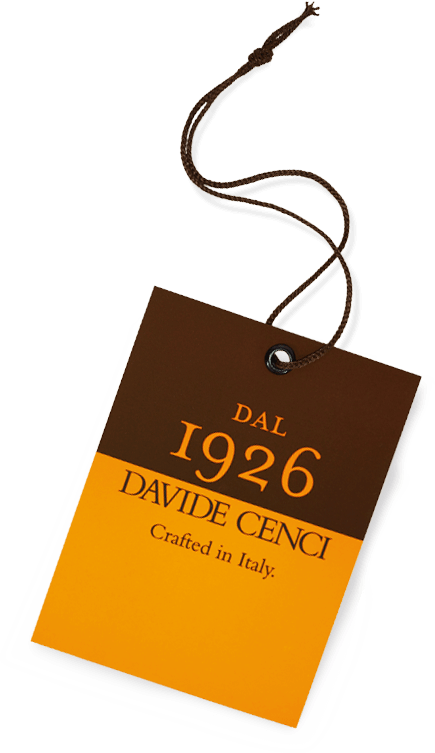 A new chapter in the history of Davide Cenci to offer its customers the best of the style for which Italy is famous in the world. A further turning point is the launch in the F/W 2018 season of the Dal 1926 collection for women, a new selection of clothing and accessories especially dedicated to women . A feminine line both in the styles and in the choice of exclusive fabrics, defined with the orange iconic details of the brand. The high quality of the fabrics and workmanship remains the focal point to ensure refined and valuable outfits for the modern, dynamic and always on the move woman who does not want to give up elegance. Since 1926, the centenary skills of Made in Italy craftsmanship continue to be enhanced by Davide Cenci's keen designer's eye. Homage is paid to these traditions, but with a nod towards the evolution of the needs of our customers, new textile technologies and new contemporary habits. Dal 1926, a style consultant with an Italian twist.